Using advanced isolation and purification techniques to purify functional fermented metabolites of Monascus purpureus NTU 568. Validating the efficacy of active components by using an animal functional assessment platform and by collaborating with multiple universities. Developing suitable fermentation methods and producing monacolin K-free, high-efficacy red yeast fermented products by using exclusive solid state fermentors. Producing active compounds-enriched red yeast extracts by using patented extraction techniques. Dietary supplements: capsules, powder sachets, and tablets. Formula additives: capsules, powder sachets, and tablets. 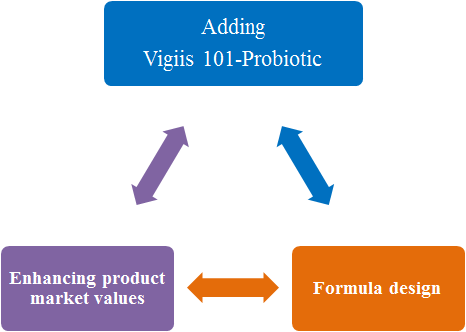 Discussing fermentation properties of different substances, such as milk, soy-milk, and fruit or vegetable juice to increase the applicability of Lactobacillus in various types of food and to develop novel functional foods. Purifying functional fermented metabolites of Lactobacillus paracasei subsp. paracasei NTU 101 by using advanced isolation and purification techniques. Establishing an in vitro efficacy screening platform to select specific active components for multiple functional purposes.